This one was different. Perry had drunk 3 pints of ale before our stores meeting, sparing us the hassle of dividing the drive up in three parts. Then we drove to Milton Keynes for a quick shop, where Perry whipped out a scanning gun and proceeded to shoot at various products as we put them in the trolley. This was fun, and efficient because we could pack the food directly. At this point, Jarv relinquished the driving position (‘I was asleep for the last 4 junctions’ he said). So I drove up the M1 to pick up some doggers near Nottingham. Apparently they’d only had 15 minutes in their shady spot. This done, Arun navigated me through Bradford, past Skipton and to the NPC. We arrived there at 12:50am, not too bad! New year, new term, new caving trip! On Saturday, DW, Fiona, Arun and I went to Rowten Pot, which I think is in Kingsdale. Sunday saw Tanguy, Larry, Will (from Nottingham) and I tackling Sunset Hole and the Grand Douk. I have said before (and I’ll say it again) that the worst part of caving is actually getting to and from the cave, including both changing into and out of all the gear, and walking over seemingly endless hills in it. Now this was true of Rowten, which involved an uphill slog in drizzle, wind and mist, but not of Sunset Hole, because - miracle of miracles - it snowed on Saturday night, and the magic of those sparkling, soft flakes transformed the admittedly arduous walk into a spectacular panorama of rolling, icing-sugar dusted moorland, scattered with limestone rocks in grey and blue, overarched by a smudged, azure sky. However gorgeous, it did raise the question: is it really caving if you don’t get changed in the cold and the wet? Well, the answer is not to worry, because the cave will still be cold and wet! Having said that, I stayed relatively dry (inside my PVC) through Rowten, despite the spray everywhere. It’s an SRT-intensive cave, where you stay on the rope all the way down, with only a few traverses and lots of “technical” rebelays (which I’m definitely getting better at!) So although my muscles protested, it was excellent training, and it made for some stunning mental images - the opening is quite, well, open, so there’s a surprising amount of sunlight silvering the edges of the rocks, and as you look up there;s a slice of (very grey) sky. Whilst I was appreciating this, Arun was descending, so add to the image of steep stone walls down from a zigzag entrance, the silhouette of a caver and his single circle of light, gracefully lowering himself into darkness - just like on a poster! Of course, it may be that I was so impressed because I still haven’t mastered descending smoothly. Instead I drop in (mostly controlled) sharp little jerks. The black-and-white theme continued deeper in the cave, where the spray of water in the helmet lights was simultaneously like being in a snow storm - where the flakes fly here, there and everywhere - and the grains on a flickering, old film screen. All of this SRT got us down to a final drop complete with a large waterfall tucked round a corner. We had to go and peer through the spray at the waterfall, just to feel the power of the air blowing off it - it was like standing on a hill in a gale, great walls of air buffeting you. And the noise! At times we had to signal using tugs on the ropes, instead of shouting, because of the roar of the water. Much prussicking later I was struggling out of my harness and into my layers, using Fiona’s car as a wind-and-rain break, and then we were speeding back to (comparative) warmth, good food and food and good company. Pasta bake (nom), plum dessert (nom) and free prosecco which someone had left behind from New Year’s (nom), with the addition of my wine, which was eventually warmed to (low) room temperature, made for a tipsy, cosy, gregarious evening. I had two goes at the table traverse (to even up the thigh bruises), one go at the squeeze machine, and Perry and I drew with Tanguy and Arun at the pot and sling game! The start of the snowfall - in huge soft flakes - caused general excitement and a surprising amount of dancing, although Josh and I opted to stay in front of the fire (perhaps by that stage this was laziness rather than a sensible decision!) and the evening culminated in a raid on the kitchen for tea and toast before we all - finally - went to bed, with the exception of Jacob, who stayed up to make friends with the cavers from coventry who, as far as I could tell, never went to bed at all. Saturday was a Kingsdale day. We divided into three teams, King, Rowten and Vespers, all three caves being quite weatherproof for the majority of the way. I wanted to go back to the nice SRT of Vespers and convinced Perry, Larry and Will to accompany me. As we were driving off towards the foggy, damp fells, I realised I’d left my furry and thermals in the cottage. Once this was remedied, we set-off for Kingsale under slight drizzle, rolling mists and banks of cloud. At the Braida Garth lay-by, we encountered some cavers from YUCC and Matt and Gary from the NPC, who were about to set off for Vespers too. We quickly agreed to give them a head start and derig their rope, which they would pick up the next morning at the NPC. The King team departed after them, whilst we Vesperites killed some time playing contact in the bus. This was successful, and after half an hour we decided against getting changed into the grim conditions, and did it in the minibus instead. By the time we mustered enough courage to get out, the drizzle had mostly let up and the cloud base risen slightly. The walk to the cave was therefore, not too unpleasant. Past the gate at the top of the steep climb, we carried on uphill until we spotted the large boulder pile that is the most important landmark on the way. From there, the walk up the shallow dry valley took us past some dolines to Vespers’, with its rectangular iron frame. The entrance bit was as scrotty as I remembered, and I was glad we were only carrying minimal amounts of gear. Once into the streamway, the crawl over cobbles gives way to a smooth, scalloped floor after some calcite drapes partially block the passage, until the stream starts to incise downwards noisily. At a little cascade, I tried to get my photography kit out, but due to condensation, my lense was too blurry for my taste, so we stormed on, keeping high above the stream until a short downclimb led to the first pitch. Constricted at the top, the landing in the full force of the waterfall for the unwary caver, a beauty. After that, the cave gets better, the streamway is sinuous, deep, tight, noisy until it breaks out into the large space of the second and third pitches. At the head of the fourth, I caught up with Matt, at the rear guard of his group. We followed along the acrobatic traverse, past a deviation (this one is hard to spot, ten metres below the main hang, on a large rock spike of the far left hand wall) to the large ledge splitting the pitch in half, where a troop of us waited for Gary to rig the last hangs. With nine of us, it seemed like it would not be possible to have everyone go down and back up again, but since Vespers was dry until now I confidently assured Matt ‘Much better to wait after having done Vespers rather than being drenched from Spectacle’s crawls!’. Matt disappeared down the fault cavern and a rope free rose from the depths. I quickly followed, eyeing warily the spashing cascade to my right, until the flow of water dissolved into wet mist all around me. I quickly passed the rebelay to reach the safety of the bottom. The floor rushed towards me at great speed until I landed heavily on clean washed boulders. I saw five haggard faces looking at me. Where were the overhangs? Could I not escape from this torrential downpour? I looked up and with great effort shouted alarmingly to Perry ‘Do not come down!’. I had agreed to derig, and having come down last, proposed to go out last. Gary, who’d rigged and thus occupied the driest spot since went up the rope, so I took his place, and waited. Then I remembered that I’d brought some sugary tea with me, opened the thermos and proposed some cups of hot beverage to anyone who was still there. Matt and I chatted for a bit, and to my surprise, learned that he’d written some of the descriptions for Eurospeleo caves, while Gary had taken the photographs. We agreed that Little Hull was a neglected cave, then the conversation turned towards the benefits of full week long caving tours and finally it was Matt’s turn to ascend. Moments later the awaited cry resounded through the cavern ‘Rope free!!!’. The rest may shock sensitive souls. The graceless ascent, the swearing, the tactless prussiking, it was all I could do to pay the cave back with its own coin. Perry did more, waiting for me to get past the rebelay to make the mighty Vespers water that much mightier. At the top, I found all three comrades waiting restlessly for the ascent to start. At least they were not completely drenched , if a bit cold. Pitch by pitch we returned to the forbidding entrance. The tortuous streamway did Perry in, punishing the generous Christmas helpings but we all got to the first pitch, where it looked like the ascent was going to be wet for those unable to bridge a near 2m gap. Again, tightness, grimness and swearing, but we got through, into the entrance streamway where we carried one bag each. Easy going past formations, descenders scraping against musical ribs of calcite and then, the entrance. Through admirable teamwork, the bags were passed through the hands and out of the boulder choke, into the black of night. We looked around, an island of light in the thick mist and gentle drizzle before making off towards what I assumed was the right direction, out of the dry shallow valley. This worked as we soon reached the massive boulder pile, then again, through guesswork followed a straight line back to the field gate, down the steep slope and to the bus. In the distance, lights from the Rowten team cast an uncertain glow across the fells. At the hut, I was surrounded by helpful hands, who in no particular order chopped mushrooms and onions and peppers, crushed garlics, cut cheese, boiled tomatoes and pasta. In the end, four large trays of pasta bake emerged sizzling from the oven. This was accompanied by prosecco, a luxury left over from the New Year celebrations. A toast and a warm meal, after a grim cave. How could it be better? It could, and soon started snowing outside. Fat, wet snowflakes drifted silently from the blackness overhead. In little time, a few centimetres covered the lawn outside and we enjoyed the show for a time, standing by the entrance to the NPC, watching, wondering what the morrow would bring. Then Dave Wilson threw a snowball at someone and the fight broke loose. Jacob and Will and Larry joined, cursing and shouting, under the silent stare of shadowy Jarv looming from the Aviary’s window. I never turn down an excuse to visit King Pot; though often in setting my course there I am surprised to find ICCC cavers leaving the sinking ship as fast as I pack 9 mm into a tackle sack. Only Dave Wilson (the second), living up to his name, was wanting to come along. Everyone is just too aware of my predilections. However, we had two innocents from Nottingham, shepherded by a rather happy-go-lucky leader, who all seemed strangely up for King yet had not yet visited its delights. Not knowing the known unknowns of caving ability, and having no idea of the unknown unknowns, we set off with a full set of ropes. One of the unknown unknowns was that Nottingham folk like playing chicken with cars, preferring to get changed in places often visited by wheels. This seems to help their natural delight in faff, as I have certainly never been on a caving trip delayed by hunting for where a central maillon had landed after being road killed. Things took a curious turn after the first pitch, when Josh asked: "Is there a lot of crawling?" "Well, no, not really." "Mmm! It's only that I don't own any knee pads." A few minutes later while I lay on my side superman'ing in the flat-out section before the second pitch, huffing as I punched the tackle sack and my SRT gear bag along, "No one said it was tight - just awkward!" "But Josh, this trip is in the Black Book of Death (NFTFH), and we're on East Kingsdale!" At Lego inlet, we ate our Raisin bagels with Edam slices (Top caving nosh! Highly recommended. The Bagel plastic bags are also pretty waterproof.) After discussing tactics and how people were feeling, we decided to go on into the T-slot with just tackle for King Henry hall. I went in front with the tackle, and things were all fine until we got to ICCC's rescue bolt (new navigation point!). This is where the rift gets wider and deeper, and the fear of being slurped down increases. The half-full tackle sack was grinning at me as it repeatedly slithered off the shelves I found for it, so I went to the end of the rift and shoved it through the tackle-sack window to the right of the hand line, then wedged myself in the rift and looked back to the lights. Much muttering was drifting down the rift, but there didn't seem much point adding my own suggestions. After a while, my arms and legs started to go numb, so I popped out the rift, pivoted around and grabbed the tackle sack. Murmurs were getting quieter, and I couldn't see any lights - so I thought I may as well pop down to Queensway while awaiting developments. Sated with a view of the metre long straw, I returned to find silence, and so dived back into the T-shaped passage with the tackle. I came upon Jacob, bringing the news that Josh had sensibly decided to bow out after not being able to get around a corner without dipping his shoulder into the rift, and not being certain that once having dipped his shoulder he would be able to climb back up. Also, a hand jammer had been dropped. I quite like recovering gear from this rift, I think I'd now have enough for an entire belt if I got to keep it. I went down on a corner, committing the slow-motion Cossack dance moves I used to memory, so I'd be able to reverse my way back up through the ribbed rift. Snatching the edge of the jammer with a stretched out heel, I had it in my clasp, and then just my instructions to reverse. We tapped our tea at Lego Inlet, drank at the stream, and then steadily progressed towards the exit. Everyone was quite happy with how far they'd got and seen some of the Kingly delights. "Discretion is the better part of valour", and there are always opportunities to return, forewarned and forearmed. "Was there much cave beyond the T-shape passage?" "Ah, well, quite a bit." Walking back across the Fell, we saw Vesper-ish lights. It was the party in advance of Tanguy, who had rigged it. It had been wet down Vesper's, and the beck was now flowing, yet King hadn't particularly responded. Back and changed, and turned the van around just in time for Tanguy, who also reported seeing Rowten lights. Home in time for tea and medals, and a rather decadent pasta bake topped with crispy cheese. It was a reduced group who set off through the snowy hills for Eastgill on Sunday morning. I would never have found Sunset Hole, because the (two) entrances are hidden amongst a sort of river bed formation of rocks and boulders, and I was much more excited by a rock bridge just over the top of the ‘dry’ entrance! There was more walking here - the ropes were more a tool or safety measure than the only way through - and it was almost cute, a teeny tiny streamway, except that it was small and uneven enough that I have purple, green and yellow, surprisingly round, spots all over my shoulders and arms. But there were some brilliant traverses when the streamway narrowed and we moved above the thinnest point, usually before dropping down a waterfall. Unfortunately - as I was reassured by Tanguy - this time the bolts and the rigging really had been put in by taller people, so I had a tough time getting past without being able to properly brace myself - enough so that I fell in the same spot both going in and out of the cave (thank goodness for cowstails). I also discovered that it’s very important to use the correct foot to brace yourself when prussicking next to a waterfall, because otherwise you swing into said waterfall and a lot of very cold water goes straight down inside all of your layers and makes you squeak. It was also a beautiful cave. Moving along the streamway parts, you passed miniature waterfalls and little alcoves full of rain, or little stone seats, like somewhere water and stone nymphs might meet and drink cocktails out of tiny, cut-crystal glasses. The algae made the water droplets glow golden, and at one point you turned a corner and there was a flame of stone, with more formations behind it twisting like seaweed. As all good caves do, it ended with a final pitch, so that you can look down into a cavern, with its own waterfall and patches of sparkle and colour - it was a fairly yellow-y, bronze-coloured cave, which I’m going to call ochre. As we came out of that cavern, we met the other group (Jacob, Josh and David), who had done Grand Douk - they described it as “aquatic” - and were then going to derig Sunset, so we could squiggle quickly out and head back across the hills to Grand Douk, taking many photographs along the way. The entrance to Grand Douk is, strangely enough, a climb. Literally up a waterfall. And as I couldn’t reach the best foothold, I fell into the waterfall and landed on my arse on the rocks (my right bum-cheek is almost entirely purple today as a consequence of this). So in fact, the others took a quick dip in the cave whilst I ate my chocolate bar and sang Disney songs at the landscape. Getting changed - even out of wet caving gear - is a zillion times easier in the sunshine, so we were soon speeding back to the cottage for tea and tasty pea soup and more pasta bake which the non-cavers had kindly prepared for us, before saying goodbye to Yorkshire and wending our way back to town, with only a brief stop in Nottingham to drop off Jacob, Will and Josh. It was a great trip, and I have great bruises, which I’m starting to recognise as a definite indication of an excellent caving experience. 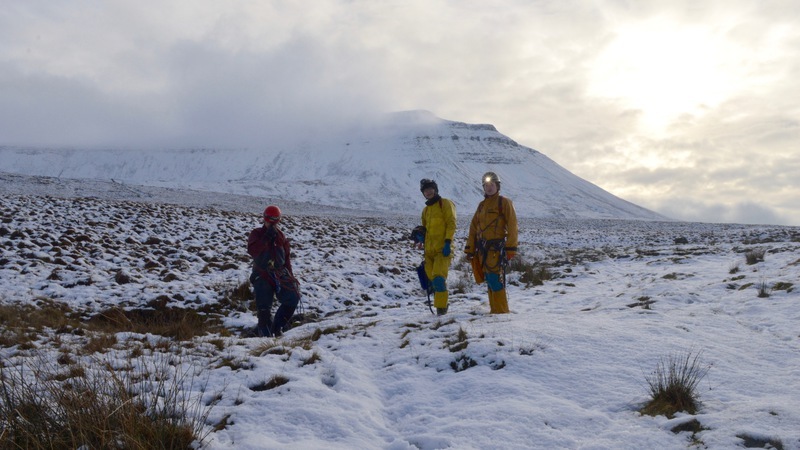 The morrow brought snow drifts on the heights of Ingleborough, Whernside and Pen-y-Ghent, and in view of possible icy conditions on the Bullpot farm road, we decided to go caving on Southerscales, a stone’s throw from Chapel-le-Dale. The sky cleared up mid-morning bringing bright sunshine on the white landscape. Eight of us departed the NPC in the minibus. We left the main road to go past Ingleton and onto the B road that leads up to the Ribblesdale viaduct. At Chapel-le-Dale, we parked on the side of the road by the start of the nature trail which climbs on the western slopes of Ingelborough. As we pulled our gear out onto the snow, Will French noticed he had left his oversuit back at the cottage – no caving for him – and concocted the back-up plan to climb the hill to have good view of the wintry landscape. The rest of us changed and before our toes could go numb started walking towards Southerscales, playing around the snowdrifts, trying to find the trail. There were quite a few other walkers and photographers, so the way was relatively well worn. The parking spot being near the top of the limestone scar, there is little actual elevation gain during the walk, but notable landmarks include a turning for Great Douk cave, a limestone pavement with prominent grykes and clints, the Braithwaite wife hole doline, one of the steepest and deepest in the Yorkshire dales. Dave Wilson, Jacob and Josh went first to Great Douk while I led Will Norwood, Stephanie and Larry to Sunset Hole, another cave on Southerscales. Past the large doline on our left, we crossed a wall and followed a vague track next to the wall in a southerly direction for a couple hundred metres. On our left, shallow valleys with gurgling torrents beckoned. Sunset Hole is found in one of them, where the water sinks in an upstream, wet streamway entrance. The slightly drier, downstream entrance is 50m away, by a conspicuous, low rock arch. Once inside, the two ways joined quickly for several hundred metres of enjoyable, cute streamway. There are a 3 small drops, rigged on P-bolts out of the water before the final, larger pitch accessed by a text-book example ‘Y’-hang. The waterfall spouts midway down the descent, on the far wall. This was pretty. At the bottom, where most people turn around (after only 40mins of caving for us), a grim canal supported by steel poles leads off. At the far side of the shaft, a tatty rope ladder leads to further extensions and presumably to a boulder choke which once provided a direct exit at the bottom of Braithwaite wife hole. This had since then, perhaps unsurprisingly collapsed. Still, this little cave was a good blast. Further up on the streamway, I noticed a dry, abandoned, scalloped riverbed leading off. After ten metres in, I decided I didn’t want to knacker my knees, but it definitely goes somewhere and I couldn’t see it on the cavemaps.org survey. On the way out, we met with Jacob and co who were to derig the cave while we had a peek at Great Douk. After exchanging a few otherworldly looks, we carried on upwards and out of the cave. Back on the surface, we saw the Sun disappearing behing a veil of white cloud which shrouded the forbidding north slopes of Ingleborough where somewhere Will was climbing. We turned our backs to the mountain and went north to find the entrance shakehole to Great Douk. At the junction, we followed a well worn path through a dry valley to walled depression. At the lower end, a gap in the stones provided access to the cave, through a steep path rushing to meet the river. We had to pick our way over mossy boulders and limestone pavements to the gaping tunnel, from which spouted an active river. Unaware of the easier, dry crawl on the right hand ledges, we tried to bridge the waterfall up into the streamway. Unfortunately, Stephanie slipped and fell backwards into the plunge pool. Drenched and somewhat shaken, she decided to stay outside the cave and warm up. The rest of us gave ourselves ten minutes to explore the easy stream passage. And easy stream passage it was. But for a plunge-pool or two, and the gradual lowering of the roof upstream, the streamway was a blur. It did a nice job of cleaning my oversuit and wellies though. Back out, we found Stephanie waiting at the top of the shakehole, catching the fading sunlight. She’d noticed the other group five minutes ahead of us on the way back to the minibus, so we didn’t lose any time in walking back to the parking spot. Then the drive back to the NPC – Perry did me the favour of resting during the day so he could drive on the way back, warm pea-and-bouillon soup à la Jarv, packing the bus and back to London via Nottingham, dropping off the NUCCs and wishing them well. A trip of two halves?, yes, two clubs?, definitely, with one purpose?, absolutely.